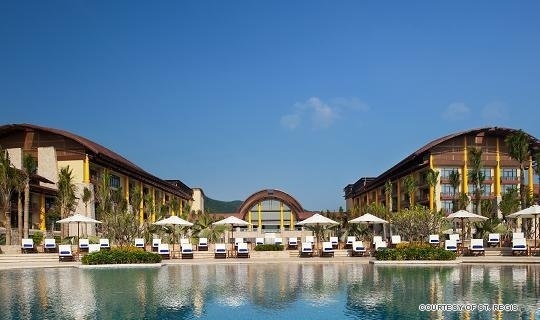 The St. Regis Sanya Yalong Bay Resort has opened South China’s first resort-based Iridium Spa. Inspired by its natural surroundings, the spacious Iridium Spa is designed around a hidden, lush tropical garden courtyard that is open to the blue sky above. It sets the ambiance for a relaxing and rejuvenating spa experience. The interior of the spa features a contemporary design utilizing a palette of natural materials and colors that include crisp white and ice blue granite, rich teak wood, and textured slate. The modern style contrasts perfectly with the traditional, lush feel of the exterior. The spa offers ten luxury treatment suites, including two large couples suites. Guests are guided along a journey of physical and spiritual wellness at Iridium Spa with a variety of signature and extraordinary experiences to release tension, pain, and anxiety and restore vitality and balance. Upon checking in, each guest is afforded their own personal treatment suite with a private shower and bathtub where they can also enjoy private tea service. The spa journey at Iridium Spa begins with a trip to the Experience Showers with Chromatherapy. These signature showers include multiple showerheads to target each meridian point on the body with a customized combination of water temperature and pressure. Colored lights are added for additional relaxation and relief. The Aromatherapy Inhalation Chamber is a warm, humid environment infused with essential oils and herbal essences to detoxify and alleviate respiratory ailments. A few minutes inside the Inhalation Chamber helps enhance the effectiveness of many treatments and additional experiences. The Mineral Salt Chamber takes detoxifying a step further in a steam zone that is infused with gentle, restorative cleansing properties of salt crystals from the Himalayas that remineralize the body and alleviate respiratory symptoms. Guests can then complete or continue their journey in the Crystal and Ice Grotto, a sparkling and invigorating environment that utilizes cold temperatures and crystal to improve circulation and strengthen immunity. The Crystal and Ice Grotto helps to facilitate and increase the effectiveness of other Iridium treatments, such as body wraps and massage.